George Lucas at the premiere of Solo: A Star Wars Story in Los Angeles. 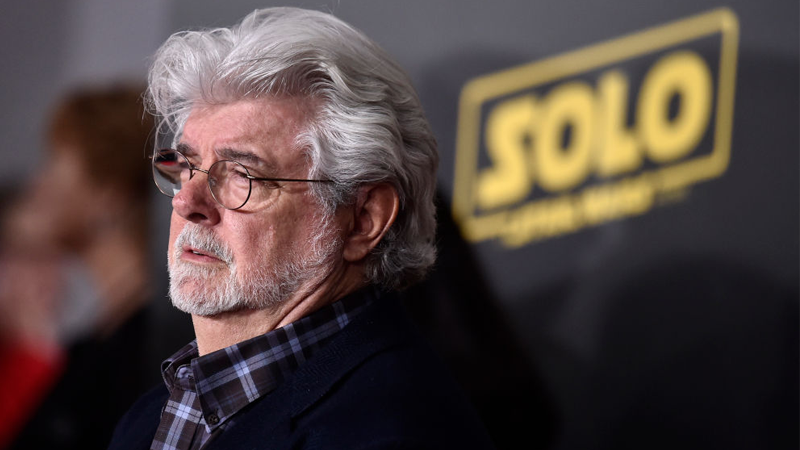 The internet has been abuzz recently thanks to a few very intriguing quotes from George Lucas, addressing where the director would’ve taken the Star Wars saga if he had not sold Lucasfilm to Disney in 2012. But while on the surface Lucas’ ideas sound wild, in some ways they’re just a different spin on ideas we’re getting in the current movies. GL: [The next three Star Wars films] were going to get into a microbiotic world. But there’s this world of creatures that operate differently than we do. I call them the Whills. And the Whills are the ones who actually control the universe. They feed off the Force. GL: If I’d held onto the company I could have done it, and then it would have been done. Of course, a lot of the fans would have hated it, just like they did Phantom Menace and everything, but at least the whole story from beginning to end would be told. At first, Lucas’ ideas sound bonkers in ways unlike anything we’ve seen in Star Wars before, even when the franchise is at its weirdest. Finally seeing the Whills, the mysterious beings present in the earliest drafts of Star Wars as a metatextual framing device? And seeing that they’re actually microbiotic creatures acting as the literal driving destiny of the entire galaxy far, far away? Lucas is right, hell yeah would fans have hated it. They’re still frothing at the mouth about midi-chlorians 19 years later! 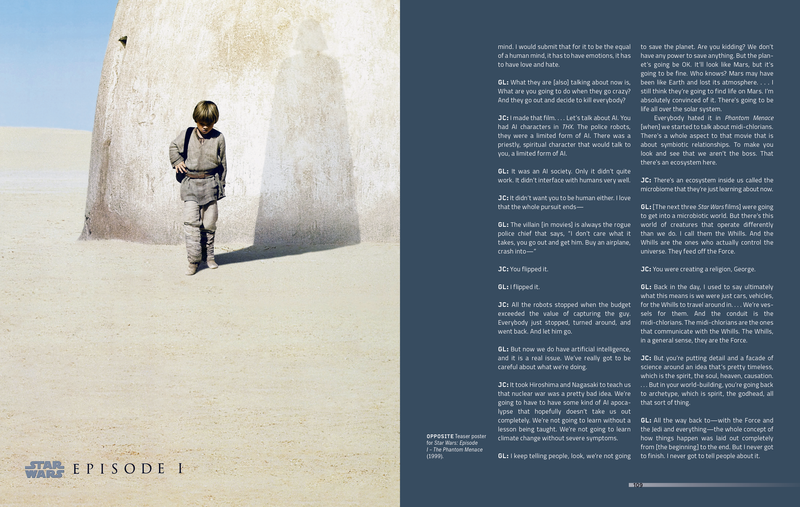 James Cameron talking to George Lucas in James Cameron’s Story of Science Fiction. Underneath the material weirdness of Lucas’ ideas with the Whills, there’s a surprisingly familiar undercurrent that matches up with where the current sequel trilogy, especially The Last Jedi, seems to be taking us: The ideas of fate and destiny, and fighting back against those concepts to forge your own path. If the Whills were meant to be microscopic organisms secretly controlling the entire universe through the Force, that definitely seems like Lucas trying to offer a “scientific” answer to an intangible concept like destiny, just as midi-chlorians were for the Force. There’s the implication of ill intent in Lucas’ words describing the Whills; they don’t guide the galaxy or influence it, and their idea of a fated destiny doesn’t seem particularly positive. They control it, and the denizens of the galaxy are mere “vehicles” for the Whills’... will, while they feed off the living energies that bind the micro-scaled world together. After six movies driven by ancient prophecies about chosen ones, and seemingly fated heroes being brought together to bring balance and light to the universe, learning that there was a potentially sinister-sounding race of microbiotic creatures behind that existential nudging is a very interesting idea, to say the least. While the Star Wars sequels we are getting don’t feature any tiny jerks trying to control the galaxy from the shadows (well, General Hux, maybe), some of the ideas Lucas had about the Whills—and the fact that destiny may not be all that it’s cracked up to be—have permeated into The Last Jedi’s subtexts. Instead of giving fate a face, as Lucas would have in the Whills, Last Jedi instead criticizes the idea of it through the institutions that upheld it, like the Jedi Order. Yoda imparts one last important lesson to Luke in The Last Jedi. Luke’s dismay at not being able to maintain the balance his bloodline was meant to bring while training Ben Solo; the fact that the supposed sacred Jedi texts were not all they were meant to be; that even figures like Yoda tell our heroes that new generations need to find their own path, beyond the rules and tenets established by the past—all these little things coalesce in the Last Jedi as a refutation of the prophecies and mythos that defined the grander story of Star Wars’ past. While we don’t know how it’ll play out just yet, the film leaves a path open for its new heroes and villains, like Rey and Kylo Ren (and a generation of Force users beyond them), to forge their own fates within the Force, rather than being subservient to the dichotomy that drove Luke, Yoda, Obi-Wan, and the Force wielders before them. It’s not quite a mysterious, microscopic race of shadowy influencers exerting their will upon the galaxy. But the thematic parallels are there, that our heroes’ destinies are theirs to control, instead of being bound by some exterior force (for lack of a better word). And although Lucas goes on to bemoan that his version of Star Wars’ continuation will go untold at this point, at least the version we are getting—divisive as it may be to some fans—seems to want to start playing with similar ideas.